BERKELEY, Calif. (AP) — Ann Coulter said in an email Wednesday that her speaking event planned for this week at the University of California, Berkeley, is “canceled” but implied she might still travel to the city or campus anyway. Amid growing concerns of violence on campus whether Coulter turns up or not, the conservative pundit lost the backing of groups that had initially sponsored her appearance. In an email to The Associated Press, Coulter wrote “Berkeley canceled” when asked to confirm if she would appear at the campus on Thursday. Coulter was invited by campus Republicans to speak at Berkeley and her speaking fee was to be subsidized by a conservative group called the Young America’s Foundation, which pulled its support Tuesday citing concerns of violence. 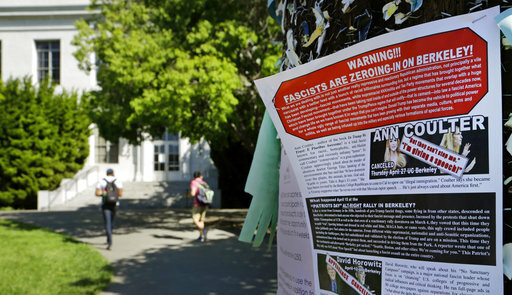 UC Berkeley officials say they are bracing for possible violence on campus whether Coulter comes to speak or not. Campus spokesman Dan Mogulof said UC Berkeley officials had not heard directly from Coulter on Wednesday. But he said even if she cancels, some groups that support or oppose her could still turn out on campus. He said police were taking necessary steps to protect the campus, but he declined to elaborate. Campus Republicans did not respond to requests for comment Wednesday about whether the group was still involved in Coulter’s appearance.